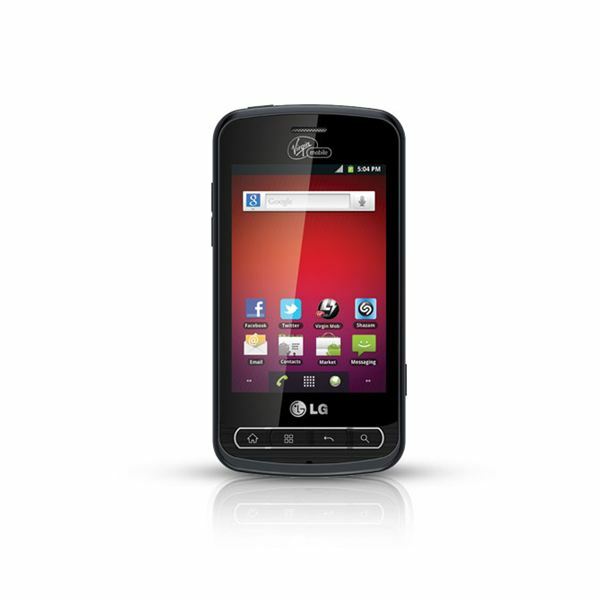 LG had a fair bit of success with their mid-range Optimus line which was made available on a number of carriers. 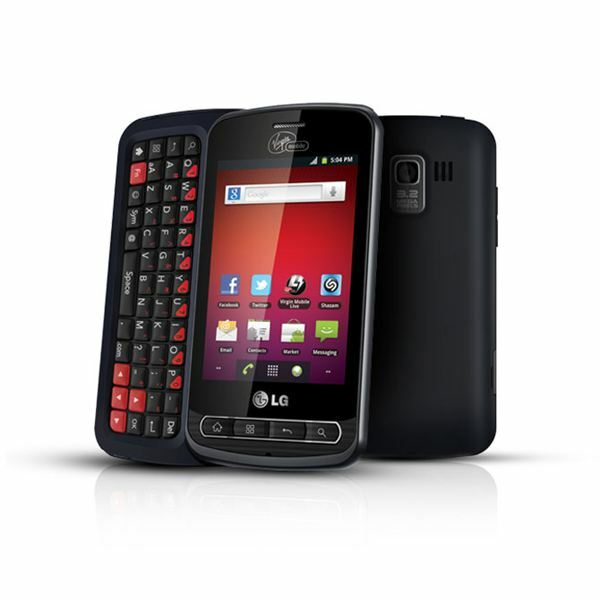 The LG Optimus Slider adds a sliding physical keyboard and is being offered as a prepaid option at Virgin Mobile. It actually has a few advantages over its other Optimus relations (like the LG Optimus V) and for under $200 it looks to be a solid option for anyone seeking their first Android device. The LG Optimus Slider has a typical candy bar design with a dominant touch screen. The first thing you’ll notice is that it is a little fat, that’s because of the side sliding full QWERTY keyboard. It actually measures 4.53 x 2.32 x 0.58 inches and it weighs a hefty 5.5 ounces. It has a 3.2 inch TFT capacitive touch screen with a resolution of 320 x 480 pixels and a pretty low pixel density of 180ppi. Below the screen you’ll find the standard four Android buttons – Home, Menu, Back and Search. On the left spine there’s the microUSB port and the volume rocker. There’s a 3.5mm headphone jack and the power button on the top. The right spine has a dedicated camera button. The camera lens is on the back. It is fairly compact and comfortable to hold. The sliding mechanism works well and the keys on the physical keyboard are well spaced and nicely raised. You’ll also find navigation keys on there so you don’t have to use the touch screen if you prefer not to. You should find it very easy to type on. The soft touch plastic back provides some grip and there’s a nice silver highlight around the Android shortcut keys. The fact that the Optimus Slider is running Android 2.3.4 Gingerbread is good and it’s a fairly vanilla user interface. You do get a bunch of pre-installed Virgin Mobile apps but that’s to be expected. Gingerbread is a great smartphone OS and new users will have no trouble getting to grips with it. The 3.2 inch touch screen means typing on the virtual keyboard isn’t great, but then you have the slide out physical keyboard to compensate so it’s no big deal. This is a CDMA 800, 1900 MHz cell phone and it supports the EV-DO Rev.A 3G network. It also has Bluetooth 3.0, Wi-Fi 802.11 b/g/n and GPS support. The single core processor is rated at 800 MHz and it has 512 MB of RAM and 512 MB of built in memory (360 MB free) which you can boost by up to 32 GB with a microSD card. It comes with a 2 GB card. You’ll find all the standard features such as a phonebook with support for unlimited entries, picture and ringtone ID. There’s a calendar, alarm, calculator and full messaging support. It also has good email support covering IMAP, POP3, SMTP, Microsoft Exchange, and Push email. Thanks to Android you have a decent browser and support for Flash. There’s also multimedia support for MP3, WAV and eAAC+ audio files and MP4, H.263, and H.264 video files. The camera is pretty basic. It is a 3.2 megapixel affair capable of capturing shots up to 2048 x 1536 pixels and it supports video recording at 640 x 480 pixels too. It does have support for geotagging and there are various scene modes but there is no flash. You can also tweak brightness and white balance and there’s 3x digital zoom. The results are pretty basic and like many smartphone cameras it does fine in well-lit scenarios and performs poorly when it’s dark. The call quality is fine, you shouldn’t have any complaints. The original LG Optimus range only had a 600 MHz processor so the 800 MHz processor on offer here is noticeably faster. They have also boosted the RAM a little. For the most part it runs smoothly but you will experience lag with intensive apps and games or if you have too much running at once. The battery is rated at 1500 mAh and they quote talk time of 3.8 hours or standby of 288 hours. How much life you get out of the LG Optimus Slider depends entirely on what you do with it, just remember that Wi-Fi, GPS, music, movies, and games are all going to run your battery down faster. Ultimately the LG Optimus Slider is far from the most exciting smartphone on the market but at $199.99 without a contract it does represent good value for money. This should serve as a good introduction to Android for anyone who is new to the platform. The main attraction over other budget devices is the physical keyboard. Although the Samsung Intercept has one and it is available for $99.99 at Virgin Mobile (it’s not a good phone though). If you are set on Virgin Mobile then the HTC Wildfire S is your best bet right now.